Looking a cheap 17.3" laptop? We take a look at the Toshiba Satellite C870-17F notebook - a laptop with Intel's Pentium B960 2.20GHz processor, 4GB RAM, a speedy 320GB hard drive and Windows 8 Operating System, all for under £400. On paper this represents a lot of notebook for your money. However how does it compare to other similar specification laptops in the same price bracket. In our Toshiba C870-17F review we test this notebook and see how it stacks up against the competition. 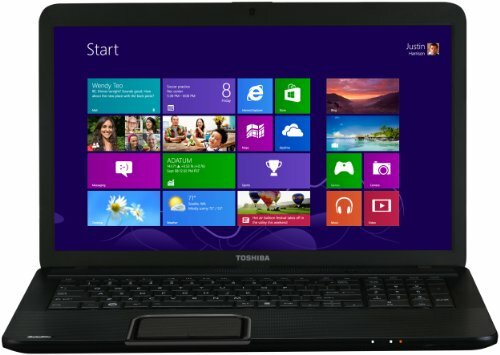 Below is our review of the Toshiba Satellite C870-17F, a 17.3" laptop, featuring 4GB RAM, 320GB hard drive and Windows 8. The first thing that defines this laptop is the size of the screen - typically in years gone by, 17.3" laptops weren't found in the sub £400 price bracket - however in light of technological advances, larger screen laptops have been coming down in price, and are now available at pretty affordable prices. However as this increase in screen size often means a lower specification overall, does this laptop offer a decent performance and compete well with regular sized laptops in the same price bracket? And despite the increase in display size, does the larger size and weight mean this laptop is less practical for those who wish to travel? Read on as we look at the Toshiba Satellite C870 - 17F notebook. Encased in a black surround, in terms of connectivity you'll find three USB ports, 1 of which is USB 3.0, the other two being USB 2.0. Also available is a handy HDMI output, as well as VGA and Ethernet, headphone and microphone jacks. At the front you'll find a card reader, and to the side is a DVD drive, thus helping you to take advantage of the larger screen when watching DVDs. The processor is Intel's Pentium B960 which runs at 2.20GHz, and is backed up by 4GB RAM and a 320GB hard drive. Operating system duties are handled by Microsoft's latest version of Windows 8. Input is handled by a full sized keyboard, which is situated to the left of a full size number pad - offering easy numerical input. Both offer an easy action - in our test period none of our testers had any issues with browsing and typing - the action was smooth and it felt comfortable to sit in front of. The touchpad offered predictable control over the notebook, with two buttons situated towards the base of the touchpad area. Commuting regularly with this laptop may become a bit of a chore - it does weigh a little extra than the usual 15.6" laptops - however for use at home it offers good performance and the larger screen means it can also double as a home cinema for students and those away from home. So overall, what did we make of the Satellite C870-17F? Pros: Large screen, pretty decent specification, all for under £400! Cons: A touch heavy and large for regular commuting. If you're after a laptop to take away to uni with you, the Toshiba Satellite C870-17F is well worth a look.